It’s nearly here! My favoite week of the year! And with a new version of DB2 announced, to boot! The conference starts on Sunday, May 22nd and runs through Thursday, May 26th. I’m a huge fan of the later timing this year to avoid Mother’s day. 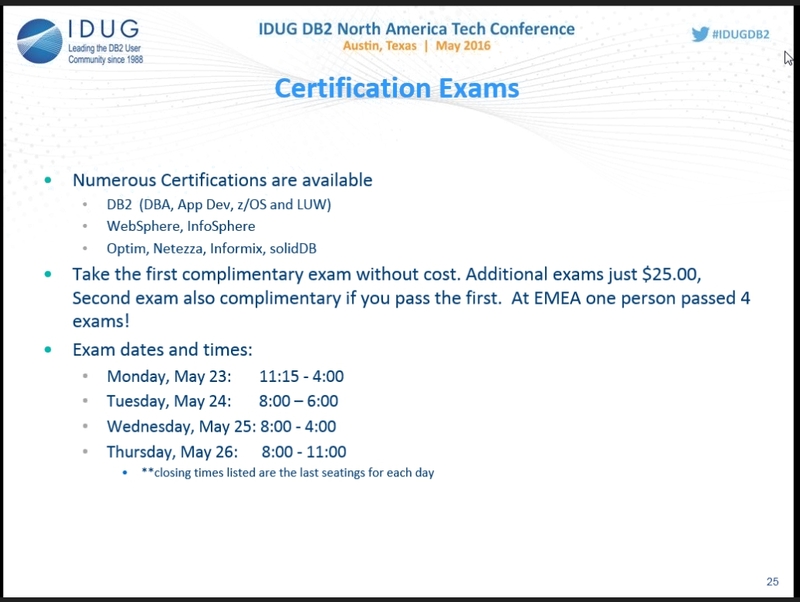 As of the time this post is published, it is not too late to register at the IDUG site if you haven’t already! The conference really starts on Sunday evening with the BMC kickoff party in the grand ballroom. There will also be coffee and tea in the morning and afternoon breaks. I’m hoping I can figure out where to locate my Diet Coke dealer – sodas are not normally part of IDUG. I haven’t seen anything about breakfast yet, so I assume it is not provided, since it has not been most years. Some of the evening events provide dinner, while others just appetizers. The Exhibit Hall is part of what pays for the conference and vendor participation really makes the conference possible. It’s also just where people hang out and go to socialize when it’s open. In past years, there has often been food and/or drinks there. There’s also a program called “passport to prizes” – when you register, you’ll get a card with various vendors on it. If you get that card stamped by all of the listed vendors, and put your name and address on it, then you’re entered in a drawing for several vendor-sponsored prizes on the last day the Exhibit Hall is open. You have to be present at the drawing to win – Though last year, I was speaking right after that, and had to miss it to get set up in the room – and I won a $50 gift card to Amazon! I was happy that they seem to make an exception to the “must be present” rule for speakers who really cannot be there and still be set up in time! It’s a small group of possible winners for the prizes, and worth checking out all the vendors to get your name in the hat. I am so excited about the mobile app this year! If it can handle the volume, it looks so much more modern and useful than ever before. I was able to answer most of the questions I have for a post like this just from the mobile app alone. I can look up sessions in my favorite way – by speaker! I think it’s still missing is integration with the agenda you build through the “My Agenda” option on a computer, but I have to say it’s better than the app in past year and the IBM Insight app as well. The app is available in the Google Play and Apple App stores. 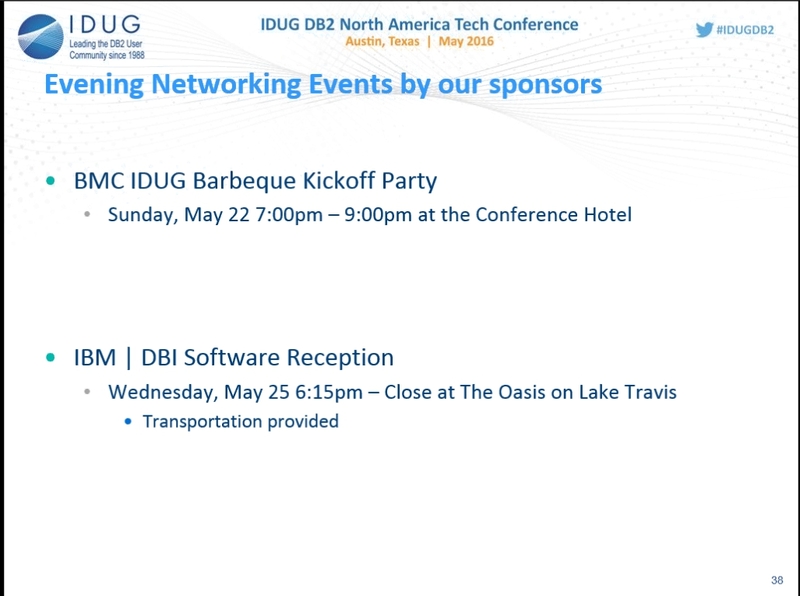 To login, you use the full email address you used to register for the conference as the ID – not just your normal IDUG ID. The package cache is a powerful memory area with many details to learn and influence. Is yours too small? Or too big? Are you satisfied with what you’re getting out of your package cache? Come to improve yourself in this area. From finding problem indexes to where SSD will benefit your database the most, come learn the high impact areas that are worth spending your time on when tuning OLTP and e-commerce databases. Each tip is infused with powerful SQL. In this time slot, Mike is up against Melanie Stopfer again! Her C01 on upgrading also promises to be a great session. C03 – SQL Infusion: Tuning and Using the Package Cache at 15:45 in San Marcos – Ember Crooks! This conflicts with Scott Hayes’ presentation on Predictive Index Analysis (D06) which also promises to be great – I love this technique and use it frequently. I am really impressed with the sessions this year – the more I looked, the more I found, and most time slots have at least one can’t miss session for me. There are many other great ones besides the above. The IDUG content comittee will again be recording some sessions for release throughout the year. The one thing I find surprising is the lack of a vNext session on DB2 11 – Am I missing it? I find it harder to justify the educational seminars now that they conflict with so many sessions. Though they were more expensive in the old format, I didn’t have to miss half a day or a full day of regular sessions. That said, if you’re going for the certification covered by the crammer course, go to Roger Sander’s crammer session – totally worth it. I have also loved Dan Luksetich’s SQL ed seminar and Scott Hayes and Martin Hubel’s performance seminars – all great content. The Wednesday event is not to be missed. I’ll be in town on Saturday, and not leaving until Friday evening, as I’m working from a nearby XTIVIA office on Friday. Most people will be arriving on Sunday and leaving on Thursday. IDUG really has it together this year. I didn’t find a single question for this blog entry that I couldn’t answer myself with the resources out there. It’s going to be a great conference. If you’re there and a reader, be sure to stop by and introduce yourself. It just makes my day to hear that people are reading the blog and really getting value out of it. Hello, I am first time attendee to IDUG.Do we have to register directly there even though we have our registration done already? “Registration” there is basically check-in. Having already registered and paid in advance, you go up to a desk and get your badge and a few promotional materials. You must then wear your badge everywhere to get into events. 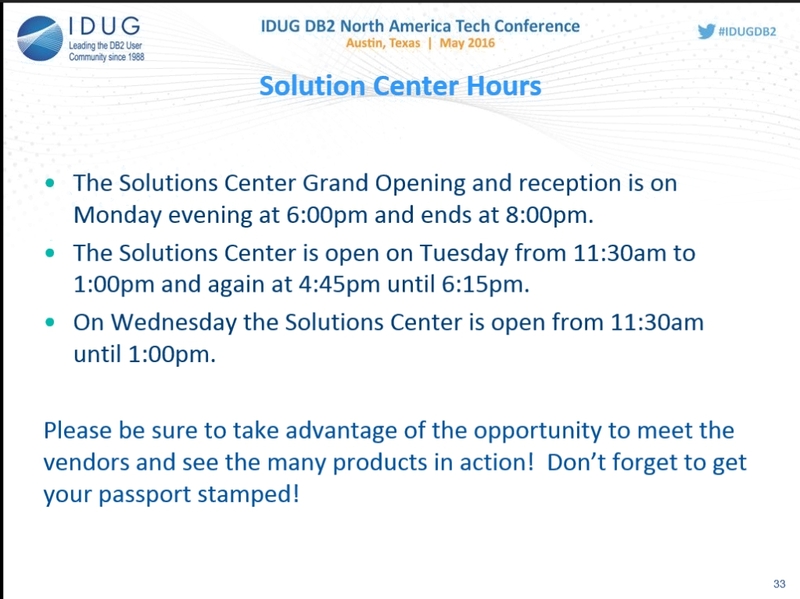 Where and when can I find the video presentations or podcasts of all the IDUG sessions. Wouldn’t it be nice if IDUG did that? They do publish throughout the year recorded versions of some of the sessions on the IDUG content blog, but not all of them.